Do thirty overs really make a difference in international and league cricket? 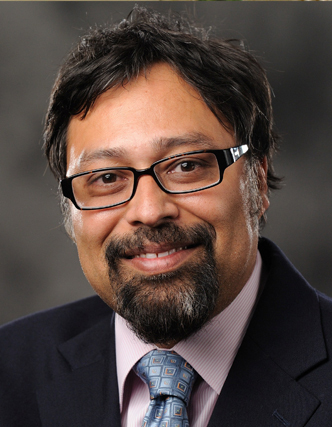 With the rise in popularity of shorter format cricket matches, Professor Sudipta Sarangi examines whether and how winning strategies differ in two formats: 50-over one-day internationals and 20-over Twenty20 internationals and Indian Premier League matches. Analysing data from 2008-2009, he finds that the 30-over difference has little effect on the winning strategy — a combination of attacking batting and bowling — in an international setting, whereas the ideal winning combination in 20-over league cricket is attacking batting and defensive bowling. Insights from this study have interesting implications for the future of cricket, particularly certain formats of the game, and the selection and development of players. The game of cricket has undergone many transformations to keep up with the changing times. Today, several formats co-exist, ranging from the gentleman’s version of the five-day Test match to the one-evening, fast-paced 20-over format called Twenty20 (T20) whose demand only seems to be growing. The objective of this study is to compare the 50-over one-day cricket format with the shorter T20 version. Popular opinion suggests that T20 is formulaic, with little scope to implement any cricketing strategy. Its critics say that T20 has reduced the traditional “bat versus ball” contest to an attacking “six-hitting” batting versus a defensive “in-swingingyorker” bowling contest. Our goal is to test the veracity of such claims. There is no doubt that T20 is quite different from a Test match. However, given that there is a difference of 30 overs between the T20 and 50-over formats, can we identify whether teams follow different strategies in this game at the aggregate level? Equating strategy with a team’s intent, measured in various ways, we examine what determines a team’s ability to win matches in these two different formats. We use data from 50-over one-day international (ODI) matches, 20-over international (T20I) matches and Indian Premier League (IPL) matches. The logic for using international games is simple: players in international matches have years of international and domestic cricketing experience and are trained by long-term strategists and coaches. To obtain insights about how the optimal strategy changes once we change the format, we need to focus on games involving such players. Our choice of a clublevel league was guided by the fact that the IPL has emerged as the most successful T20 league. Hence, it would be interesting to see how the optimal strategy changes once we move from international cricket to league cricket. By the 1960s, first-class cricket, which formed the backbone of English cricket, had started to lose its appeal. Not only did a match go on for several days, it was usually inconclusive as well. Hence, oneday cricket was first introduced in the domestic English cricketing circles in the 1960s with the aim of providing result-oriented and fast-paced cricket (Kitchin, 2008). The hope was that this abridged version would restore interest in the game and attract a broader audience – and it did! The other cricketing nations were quick to adopt it. The first ever ODI match was played on January 5, 1971 between England and Australia at the Melbourne Cricket Ground in Australia with a win for the home team. However, it was with the introduction of the Cricket World Cup in 1975 that ODI really took off. Unfortunately, it also had an unintended consequence. The rise of ODI led to a fall in the popularity of domestic cricket in most cricketing nations. In response, the England and Wales Cricket Board reverted to their 1960’s strategy and came up with an even shorter version of the game. In 2003, they knocked off 180 deliveries from the ODI format and introduced a 20-over (one-evening) version of the game in their domestic circuit. This version, with non-stop action in a three-hour period, became an instant success and other cricketing nations quickly followed suit. T20 cricket was introduced in domestic circuits in Pakistan and South Africa in 2004, in Australia in 2005 and in West Indies in 2006. The fi rst international 20-over match took place on February 17, 2005 when Australia played and defeated host New Zealand at Eden Park, Auckland. The International Cricket Council (ICC) subsequently organised the first T20 International World Cup in 2007, adding further momentum to the popularity of this format. Following India’s victory in the inaugural T20 International World Cup, the Board of Control for Cricket in India (BCCI) decided to establish a T20 cricket league in India known as the Indian Premier League (IPL) along the lines of the English Premier League in soccer. BCCI’s aim was to establish a global league where each team would have international players but maintain its local identity by including at least one iconic Indian player and being associated with a specific Indian city. An auction with a cap on the amount a team could spend on player acquisition allowed teams to choose their international and local players. The rules allow teams to have up to four international players with the proviso that the remaining players must be from India. It’s worth noting that the financial payoff from a few weeks of commitment makes this league very lucrative for international players. For example, Andrew Flintoff and Kevin Pietersen from England each attracted bids worth US$1.55 million in the 2009 IPL auction (Rumford, 2011a). The inaugural IPL competition took place during April-May 2008 between eight teams competing on a home-and-away basis. These were the Bangalore Royal Challengers, Chennai Super Kings, Delhi Daredevils, Hyderabad Deccan Chargers, Jaipur Rajasthan Royals, Kolkata Knight Riders, Mohali Kings XI Punjab, and Mumbai Indians. Not surprisingly, advertising, media campaigns, a dollop of Bollywood glamour, satellite and television rights and ticket sales in the SouthAsian market of 1.5 billion consumers have made IPL the most successful and cash-rich league in the world. Before proceeding further, let us quickly recap the main differences in the rules between the ODI and T20 formats. Given that both are limited overs matches, the rules are similar but have some small variations to make T20 a fast-paced, television friendly form of cricket that lasts only three hours. Apart from the missing 30 overs in T20, each bowler is allowed to bowl a maximum of four overs in T20 as opposed to 10 overs in ODI. Moreover, T20 rules provide some additional advantages to batsmen. For example, in ODI, a “no-ball” (illegal delivery) by the bowling team results in an additional run being awarded to the batting team, while in T20 the latter earns two runs. Moreover in T20, the nextball bowled is considered a “free-hit” for the batsman who can only be dismissed via run-out. There are also strict penalties in T20 for wasting time. Umpires can penalise a bowling team found guilty of wasting time by awarding five additional runs to the batting team. Finally, to ensure a result in the case of a tie in T20, the winner of the match is decided through a oneover-per-side “super-over,” where the team scoring the most runs in the “super-over” is declared the winner. To better understand the insights from this analysis, let us quickly recap what is known about the quantitative analysis of cricket games. Typically, studies in this area assume that the outcome of the game is a function of inputs like batting and bowling. Schofield (1988) conducted the fi rst such study, in which he estimated the outcome of two different formats in English county cricket: the three-day County Championship and the limited overs (40-over per innings) John Player League for the 1981-83 seasons. He found that attacking batting – measured as runs scored per over – had greater importance in both formats. The strength of bowling inputs differed between the formats, with defensive bowling measured as runs conceded per over being a key factor in winning limited overs games. Brooks et al. (2002) found the average batting and average bowling strategy (implying a mix of both attacking and defensive strategies) to be the optimal mix for most test-playing nations. Besides batting and bowling inputs, researchers have also studied the impact of other factors such as toss and home team bias on match results in cricket, but have found no systematic patterns in these external factors. In our approach, a team’s winning ability is written as a function of the inputs of batting, bowling and fielding. At the aggregate level, these inputs can be measured in different ways, and to capture intent of a team, we divide inputs into two categories: attacking and defensive. Fielding is ascribed solely to the defensive category. Of course, these input measures are also affected by other observable and unobservable factors. Observable factors include toss outcomes, home team bias and weather conditions and can be taken into account. Examples of unobservable factors include player ability and form, captaincy skills, coaching skills and team management skills. These are controlled for through statistical analysis. Note that a team’s selection of batting or bowling approaches may be conditional on the choices made by the rival team. However, at the time of making its choice, a team may not be fully aware of the other team’s choice. Hence, we identify the optimal combination of input measures independent of the opposing team’s choices. We consider all IPL, T20I and ODI matches in 2008 and 2009. We obtained data from the CRICINFO website (http://www.espncricinfo.com) on batting, bowling, fielding and other related inputs for the 276 ODI, 77 T20I and 118 IPL matches that took place during that period. Our analysis attempts to understand the determinants of wins. We divide the batting and bowling inputs into two categories based on attacking and defensive intents. 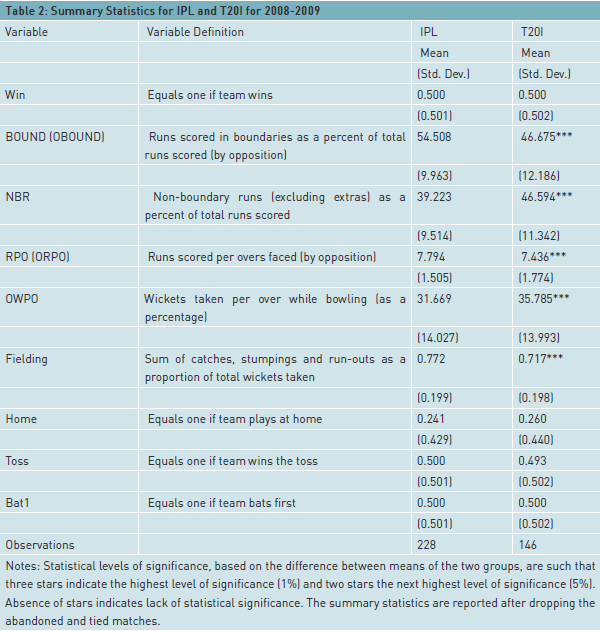 The batting variables are runs scored through boundaries (fours and sixes) as a percent of total runs scored (BOUND) and non-boundary runs (excluding extras) as a percent of total runs scored (NBR). BOUND may be thought of as an “attacking” batting measure while NBR is a “defensive” batting measure. The set of bowling variables comprise the following: opposition wickets taken per over expressed as a percent of overs (OWPO) and the number of runs allowed through boundaries (fours and sixes) as a percent of total runs scored (OBOUND). Clearly, OWPO reflects attacking bowling intent while OBOUND expresses a defensive bowling intent. Our fi elding variable (Fielding) is the sum of wickets that can be attributed to fielding (catches, stumpings and run-outs) as a proportion of total wickets taken. Other independent variables include variables reflecting whether a team played at home (Home), whether a team won the toss (Toss), and whether a team batted fi rst (Bat1). All of these take binary values and enter the regressions as typical dummy variables. The tables show that there are no significant differences in the outcomes between ODI and T20 matches or between IPL and T20I matches. 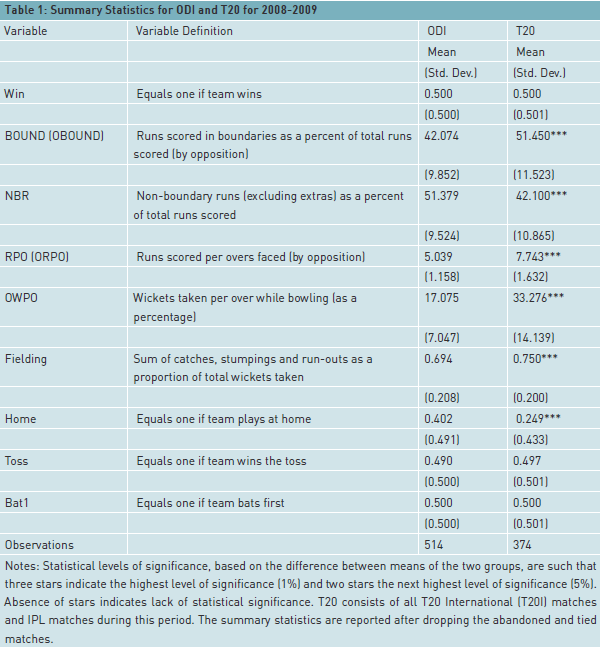 In Table 1 we see that, as popular opinion suggests, attacking batting plays a more important role in T20. Non-boundary runs, on the other hand, are more important in ODIs. Similarly, we find that contrary to popular opinion, T20 is not all about batting. Attacking bowling is more important here than in ODIs. From Table 2 we learn that IPL is certainly the more aggressive format when it comes to batting while attacking bowling is more important in T20I. The average value for the fielding variable is significantly higher for T20 in comparison to ODI. Similarly, the fielding variable has a higher mean in IPL than T20I. This is possibly due to the fact that the faster rate of run accumulation creates more chances for the fielders in T20. Also note that the Home variable is statistically significantly different between ODI and T20 possibly because the 2009 IPL games were held in South Africa. We now look for insights beyond these tables of simple averages by using statistical analysis. The insights presented below are neither specific to a team nor in response to a specific team’s choices; they identify winning combinations of batting and bowling inputs for a team based on the format of the game. Note that our model includes year (fixed-) effects to isolate out any qualitative changes in a team between 2008 and 2009. Finally, we use the relative strength of the input measures and selected test statistics to identify the optimal batting and bowling strategy combinations. Attacking batting and bowling intents clearly emerge as the optimal combination for a team in both ODI and T20I. In fact, defensive batting actually lowers the probability of winning both at the international and league levels. However, the optimal combination for IPL turns out to be attacking batting and defensive bowling. Interestingly, for IPL, attacking batting leads to a greater increase in the probability of winning compared to the two international formats. Also, in contrast to ODI and T20, in IPL matches a team that adopts defensive bowling has a higher probability of losing. One possible explanation for these differences in results is that both ODI and T20I involve national teams where players have years of international and domestic cricketing experience and teams are developed through long-term training by professional coaches and tips from think-tanks and managers. With such skilled batsmen and bowlers at its disposal, a team has the necessary resources to adopt attacking batting and bowling measures. For teams in the IPL, on the other hand, it could be argued that they lack the skill set and specialisation of a national team. Moreover, given that there is a premium on run accumulation, an IPL team might focus on strengthening its batting line-up by recruiting international batsmen and all-rounders, while relying more on local talent for bowling. Given this scenario, one possibility might be that IPL teams lack the skill set and resources to pursue attacking bowling, and hence focus on limiting the opposition to a relatively lower total to maximise their winning probability. Fielding and Other Inputs: The fielding variable does not have any significant impact on winning for any of the three types of games considered. This may be due to the fact that the fielding variable is only based on the wickets from fielding and does not account for its role in restricting runs. Unfortunately, the construction of a fielding variable that takes its dual role into account requires a ball-by-ball analysis of each match rather than aggregate match-level information. We find that winning the toss has no effect on the outcome of the game in any of the three formats. However, unlike ODI and T20I, there is a significant home team advantage in IPL. In our approach, a team’s winning ability is written as a function of the inputs of batting, bowling and fielding. At the aggregate level, these inputs can be measured in different ways, and to capture intent of a team, we divide inputs into two categories: attacking and defensive. Fielding is ascribed solely to the defensive category. Although the optimal bowling choice differs for league matches, the required skill sets are similar across all formats. This has implications for the choices that the players will make in the future. Given the popularity of T20 and the monetary benefits associated with leagues such as the IPL, players will probably prefer the shorter format. Quite likely, as argued by Rumford (2011b), this will have consequences for player development. League cricket itself has little interest in developing cricketing skills as players are pooled only for a few weeks in return for large sums of money and there is little incentive to nurture budding talent. Of course, it is also possible that in the future, cricketing nations will have specialised teams for the different formats. In fact, it is already the case that different national squads are chosen for Test cricket and ODI. Hence, we believe that due to the considerably more aggressive nature of T20, there will be very different squads for Test cricket and T20 with somewhat dissimilar squads for the two shorter formats. Of course, these input measures are also affected by other observable and unobservable factors. Observable factors include toss outcomes, home team bias and weather conditions and can be taken into account. Examples of unobservable factors include player ability and form, captaincy skills, coaching skills and team management skills. Finally, the success of T20 poses a threat to the future of the game itself. Its growing popularity is creating pressure on national boards to accommodate more T20 matches in both their domestic and international calendars. Inspired by the success of IPL, many national boards are setting up domestic T20 leagues that will further crowd out other formats. On the spectator side, it is sometimes claimed that T20 has made a dent in the viewership and popularity of the 50-over game. In his 2011 Sir Donald Bradman Oration lecture at Canberra, the well-known Indian batsman Rahul Dravid referred to empty stands in the then concluded India-England one-day series and suggested a reduction in the number of ODI matches. He went on to say that the game itself was at a crossroads and that the future needed to be thought out carefully. Most likely however, both ODI and Test cricket will continue to exist for the purists who enjoy the finer points of the game, though there might be fewer games to watch. Moreover, since the majority of the ICC’s revenues currently derive from ODI, this format’s decline in importance will not be immediate, but we can only speculate as to when it will come to pass. Sudipta Sarangi is the Gulf Coast Coca-Cola Bottling Co., Inc. Distinguished Professor of Business Administration in the Department of Economics, Louisiana State University at Baton Rouge.